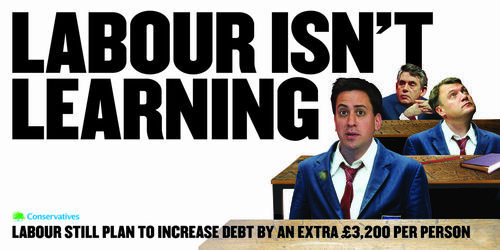 The Conservative Party have launched its first attack poster on Labour since the last general election and it features the headline ‘Labour isn’t learning’; it intends to highlight the fact that the Institute for Fiscal Studies’ estimates that Labour would borrow £200 billion more than the Conservatives. 1. There was very high unemployment at the time. 2. There was a Labour government who’s policies were criticised for hampering employment. IT WAS A PLAY-ON-WORDS, A PUN, A DOUBLE EN-F*****G-TENDRE. Your poster does not have this wordplay and so is not clever, funny or impactful. – It was the first time a professional ad agency was used to create a piece of British political advertising. – It was the first time a 48-sheet poster had been used for a piece of political advertising in Britain. Is your poster – lacking in originality or wit – breaking new ground in any way that is comparable to these either of these two things? No. Is adding some cartoon images that have no relationship to the original going to make up for that? Absolutely not. It’s been 34 years since ‘Labour Isn’t Working’ was launched – THIRTY FOUR BLOODY YEARS – isn’t it time you came up with something new?? ?